On the support forum is a thread where folks can make suggestions for articles. Among them, someone mentioned an article on supplements. I had previously (I think in one of the newsletters) made a list of my ‘Top 10 supplements’ or whatever but since the archives are now defunct, it needed to be recreated. Since what I want to do is going to be long, as usual I’m going to split it into two pieces. For the record, this is actually the near entirety of Chapter 11 from the soon to be completed project: Applied Nutrition for Mixed Sports. I had mentioned this in the last newsletter and the final files are being processed right now, after one more edit it will be made available. Probably in about 2 more weeks. The project actually started life as a seminar I did in Vancouver last year for the Simon Fraser University soccer and football athletes. When completed, the product will include 2 DVD’s along with the original Powerpoint slides as well as a complete 80 page stand alone book examining the topic that I wrote to go along with it (the book started out as handouts I gave to the athletes but I decided to write an entire book around the handouts). As always, newsletter subscribers will get first crack at it at a discounted price so go sign up if you haven’t already. And with that out of the way, here’s a quick look at the topic of supplements, while the information was originally aimed at mixed sports (think team sports, boxing, MMA, anything that requires a mix of strength, endurance, etc. for performance), what I have to say pretty much applies to other areas as well including bodybuilding and pure strength training. Of course, I’m sure readers will have some pet supplement that they take for some very specific reason (e.g. B12 because they lack the absorption factor, or something to control blood cholesterol or whatever). The list below isn’t meant to be comprehensive. Rather, it’s meant to look at the supplements that have the most broadly generalized use and application (for all types of athletes) along with having research or backing to support their use. So please don’t get edgy in the comments if I left out something that you just swear by for some very specific use. If there is a single area of sports nutrition that is constantly changing (in terms of the products being marketed) and which athletes are always interested in it’s dietary supplements. As I mentioned in Chapter 2 of this book, I consider supplementation to be the third tier of the pyramid (after overall daily nutrition and around workout nutrition) in terms of what athletes should concern themselves with. Even there, I divide dietary supplements into several categories and want to present another pyramid for dietary supplements, shown in Figure 1 below. Just as with the overall nutritional pyramid, I put supplements into three categories in terms of their relative importance. The first is simply general supplements, either acting as nutritional insurance or essential nutrients (such as fish oils) that almost all mixed sports athletes can benefit from. Once those have been taken care of consistently, supplements that directly impact on performance and which have good research backing should be considered. Once that tier has been taken care of, various supplements which I term esoterica (this category is always changing) can be considered. The tip of this pyramid should only be considered by athletes who have all aspects of both their overall diet, around workout nutrition and other supplements taken care of. Simply, esoteric products can, at best, provide the last tiny percentage point for performance and recovery. Worrying about that when the majority aspects of diet and supplementation have not been taken care of consistently is pointless. As noted above, general use supplements are those products that basically all athletes can not only benefit from but probably should at least consider. Short of correcting a frank deficiency, they don’t generally have vast noticeable improvements in performance per se; rather they simply support overall health and daily nutritional requirements. Many of the nutrients discussed below are simply those that are commonly deficient among athletes, others (e.g. vitamin D, fish oil) are usually deficient in just about everyone. Generally, these supplements should be taken with meals and doses can be split morning and evening and taken with meals. As I mentioned in a previous chapter, there are both reasons to believe that athletes need increased amounts of vitamins/minerals due to their heavy training as well as that they get more due to increased nutrient intake. I consider a basic one per day multi-vitamin/mineral a cheap nutritional insurance. It won’t hurt and may correct and/or prevent any minor deficiencies. For the most part, I see little need to purchase super expensive formulations, athletes who are obsessed with such can buy cheaper and simply take two (split morning and evening). I would note that men, especially those who eat a lot of red meat, may want to find a product that does not contain iron. Women, due to their propensity to develop anemia (due to both dietary choices and monthly blood loss) should choose a product containing iron. As a final note, under no circumstances should athletes assume that they can ignore important aspects of their overall diet because their multi- will ‘cover it’. As discussed in a previous chapter, protein powders have been staple of athletic nutrition for decades and exist somewhere between food and a supplement. While obtaining all but the highest intakes of protein can generally be done with nothing more than food, protein powders can provide convenience and flexibility for athletes having problems meeting their protein needs. They can be especially valuable when athletes travel and may have their normal food patterns disrupted. 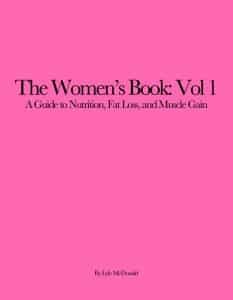 Specific types of protein powder are discussed in Chapter 4. For the most part, buying protein powders commercially is a losing proposition, you will pay twice as much for half the product and I recommend that athletes find reliable online suppliers to purchase protein powder in bulk. I’ve provided a few online resources at the end of this book that I trust to provide quality product at a good price. If there is a single nutrient that is almost impossible to achieve adequate amounts of with the modern diet (outside of the handful of people who eat a lot of fatty fish), it’s the w-3 fish oils. In a very real sense, fish oils ‘do everything’ and impact on not only overall health but help to control inflammation, promote fat oxidation, inhibit fat storage and a host of others. It’s a list of benefits that seems almost too good to be true but the research is there. Due to their general unavailability in the food supply, supplementation is almost necessary and both pills (containing varying amounts of the active EPA/DHA) and liquids are available. Both are acceptable and some people simply prefer the liquids (which can be used on salads or in blender drinks) to pills (which often cause burps). Years ago, flaxseed oil was suggested as a source of the essential fatty acids as it contains the parent fatty acid that can be converted into EPA/DHA. However, that conversion is exceedingly inefficient in most people (vegetarians appear to be an exception to this for some reason) and I do not feel that flax is an acceptable substitute for fish oil supplementation. I suggest that athletes find an omega-3 fatty acid source that they like and consume it daily (again, consuming cold water or fatty fish is also a possibility). While little research has examined athletes, I recommend a total intake of EPA/DHA of 1.8-3.0 grams per day. A fairly standard capsule of fish oils may contain 180 mg EPA and 120 mg DHA (300 mg total fish oils) so that daily dose would require 6-10 capsules per day which should be split at least morning and evening (taken with meals). Higher concentration fish oils are available (at a premium cost) but may be preferred by athletes who don’t like swallowing pills. Again, the goal should be a total EPA/DHA intake of 1.8-3.0 grams per day regardless of how it is obtained. As I mentioned previously, calcium deficiencies are not unheard of in athletes; this is especially true if athletes can’t or won’t consume dairy products. And from an overall health issue, calcium is critical, perhaps more so for female athletes to ensure good bone health later in life. Of course, telling athletes to take something on health grounds is often a losing proposition so consider that a great deal of research suggests that calcium (and dairy calcium more than other forms) may improve body composition. A minimum daily intake of 1000mg calcium is recommended and I’d note that a single serving of most dairy foods will contain roughly 300 mg. If you consume 3 servings per day of dairy, you needn’t supplement. If your intake is less than this, you may need to consider a supplement (multi-vitamin/mineral pills never contain sufficient amounts). Calcium citrate is the preferred form and most calcium products will contain some Vitamin D as well (see next). Calcium supplementation should be split into two doses consumed morning and evening with meals as this provides better overall uptake. It’s not an exaggeration to say that concerns about Vitamin D levels are currently a ‘hot-topic’ in nutrition. And while Vitamin D can be made by the body (through exposure of the skin to sunlight), it’s turning out that Vitamin D deficiencies are absolutely epidemic, especially for people who work indoors and/or live in cold weather countries where sun exposure is minimal. Athletes who are forced to train indoors for weather reasons are potentially at risk as well. This is true even of athletes who train outdoors part of the year as Vitamin D levels in the body fall fairly quickly when regular sun exposure is eliminated. For athletes who don’t want to take yet another pill, tanning once or twice weekly provides another way to obtain Vitamin D. Don’t go nuts with it (as excessive UV skin exposure carries its own health risks) but small amounts during cold weather or periods where sun exposure is minimal are not harmful and may help. As mentioned previously, both zinc and magnesium are often deficient in athletes; zinc is often low in athletes who forego red meat and magnesium losses increase with heavy training. Both are critical for optimal performance and various processes important to athletes. As well, many find that the combination of the two taken at bedtime helps with sleep, a process critical to overall recovery. On average, a daily supplement of 25 mg of zinc (any form is basically fine) with 400-500 mg of magnesium (citrate is the preferred form) taken 30 minutes before bedtime helps many go to sleep. While many commercial zinc/magnesium products contain B-6, this seems to hurt sleep for some people and I suggest buying the ingredients separately if they are taken. I’d note that magnesium oxide, which is the most commonly found form of magnesium is poorly absorbed, as noted above citrate is the preferred form. A supplement that is insanely popular with bodybuilders (who think it builds muscle, which it doesn’t), glutamine is an inessential amino acid that is heavily involved in immune system function. Given the propensity of athletes to suffer problems with their immune system secondary to heavy training, anything that helps support the immune system is potentially good. The research on glutamine and immune system function is actually rather mixed, some finds that it works while other work has not. It’s more likely that branched-chain amino acid (BCAA) supplementation, discussed in the next section, works as well if not better. From a purely experiential standpoint, I have found that the consumption of high doses of glutamine and Vitamin C at the first sign of a cold tends to stop it in its tracks. Two to three grams of glutamine with 500mg of Vitamin C taken multiple times throughout the day seems to do the trick. The term anti-oxidant actually refers to a massive number of different compounds (including but not limited to Vitamin C, Vitamin E, Vitamin A, Beta-carotene and many others) that help to scavenge free radicals in the body. Free radicals are formed during heavy exercise and early ideas held that this was damaging to the body. And while it is true that excessive free radical production can cause problems, research actually has found that free radical production is critical in signaling adaptations to training; blocking free radical formation can actually inhibit proper adaptation to training, especially endurance training. Additionally, while research on diets that are high in anti-oxidants (e.g. whole food diets containing lots of fruits and vegetables) often find health benefits, studies using isolated anti-oxidants have generally not found the same results. This again points to the importance of obtaining most nutrients from whole foods rather than isolated pills. For the most part I do not advocate the intake of high-dose isolated anti-oxidants for mixed sports athletes under most circumstances. An exception is the high-dose Vitamin C mentioned above with glutamine when an athlete starts to feel a cold coming on. This is especially true during primary training phases where excessive anti-oxidant supplementation have the potential to impair optimal adaptation. However, during the season, when the goal is primarily to survive competition (which may be very frequent depending on the sport), supplementation may be useful. Some athletes report decreased soreness and improved recovery. Since the goal in-season is competition and not improving fitness or training adaptations, this may be worth considering. So while avoiding anti-oxidants during the main training period is probably the best course of action, there may be some merit to supplementation to survive a heavy competition season. On Friday in Supplements Part 2, I’ll continue with Performance Supplements and Esoterica.